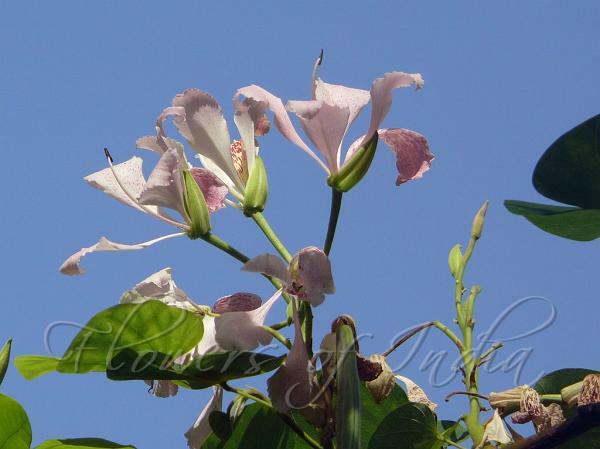 Pink Butterfly Flower is a small evergreen tree. it can grow 3-15 m tall. The bole can be 50 cm in diameter. The older stems are covered with a smooth grey coloured bark. These stems are also covered with numerous small darker spots (i.e. lenticels). Younger stems are almost hairless. its simple leaves, 7-20 cm long and 7-20 cm wide, have two lobes and are folded in the centre, like a pair of butterfly wings. The flowers are borne in small clusters in the leaf axils, and individual flowers have very short stalks, only 2-5-4 mm long. The showy flowers have five pinkish petals, each about 4.0-5.5 cm long and 2-3 cm wide, mottled with darker reddish-purple, one of which is more colorful than the others. There is a single large curved stamen, and there are usually also five tiny staminodes, about 3 mm long. its fruit is a large, elongated, pod, 15-22 cm long, containing about 10-20 seeds. 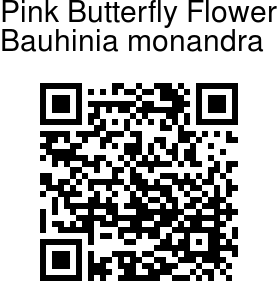 Pink Butterfly Flower is widely cultivated as an ornamental, but the origin is uncertain with different sources suggesting areas such as the Americas, Madagascar, Myanmar, Borneo. Identification credit: Aarti Khale Photographed in Sagar Upvan, Mumbai.